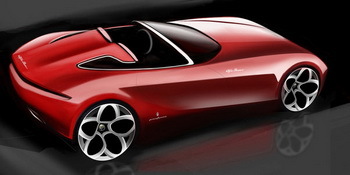 Pininfarina is counting down to launching its Alfa Romeo "Spider" concept at the Geneva Motor Show, a show car that will launch its 80th anniversary year and demonstrate that the troubled design house is on a new path to a strong future. Pininfarina's Alfa Romeo Spider concept set to be unveiled next week in Geneva looks likely to be one of the stars of the world's most important motor show. Pininfarina's financial problems have been played out in public over the last two years as it got itself into huge difficulties making investments in contract manufacturing projects that offered the slimmest of profit margins and looked dubious prospects from the start. These troubles that destroyed shareholder value and saddled the Turin-based firm with huge debts, brought the famous design house to its knees with the Pininfarina family forced to quit its shareholding last summer and the firm to divest itself of most of its long-time contract manufacturing facilities, with the reborn DeTomaso brand taking over its famed Grugliasco plant. Instead Pininfarina is now focusing its future on its core historic values, and its Alfa Romeo "Spider" concept sports convertible set to be unveiled next week in Geneva looks likely to be one of the stars of the 80th edition of the world's most important motor show. "Our Spider concept celebrates the historical shapes, but also lays out a design language for the future,” Pininfarina Design Director Lowie Vermeersch commented in an interview last week. Chairman Paolo Pininfarina sees the project as part of a much wider thrust: "Our achievement is not any single car, but the establishment of Pininfarina as a world reference for Italian style." Silvio Angori, CEO and COO of Pininfarina said in an interview recently that "contract vehicle manufacturing is vanishing because of the new level of flexibility at large companies. Automobile manufacturers, he commented, have "in essence have become carrozzerie themselves," due to modern manufacturing methods that allow huge flexibility to send variants down the mass production lines. 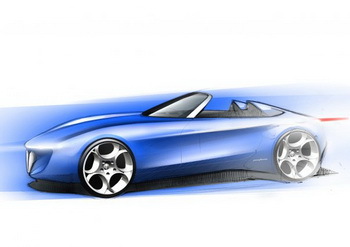 "Now Pininfarina is reinventing the world of carrozzeria," Angori continued. "Our future rests on design, meaning style and engineering services, on ecomobility and on our brand equity." Pininfarina designs cars for Ferrari and Maserati, and the 458 Italia and GranCabrio, for the former and latter respectively, demonstrate that despite the rocky patch it has lost none of its skills. It is also involved in an ambitious joint-venture with French industrial conglomerate Bolloré to build an electric city vehicle, the Bluecar.